The existence of gravity is indisputable, but its cause is quite another matter. You see, uniting gravitation with the other forces (i.e. - finding a common description) remains an elusive problem for Physics to solve. The complete description of gravitational forces is only possible if the geometry of space itself is well understood, and this can be very difficult to ascertain. While the dimensionality of space on Earth, at a human scale of size, is relatively simple to understand, the way reality behaves for things which are exceedingly small, or extremely large, is a different matter entirely. This is not the biggest problem, however. Certain basic considerations make it nearly impossible to see the stage upon which events in our universe unfold. It is hard to look at the arena of events directly, at least without the players getting in the way. In addition, the act of observing can influence the outcome of things. To understand how gravity arises, however, we need to look behind the scenes, and see the very fabric of which our space-time is constructed. 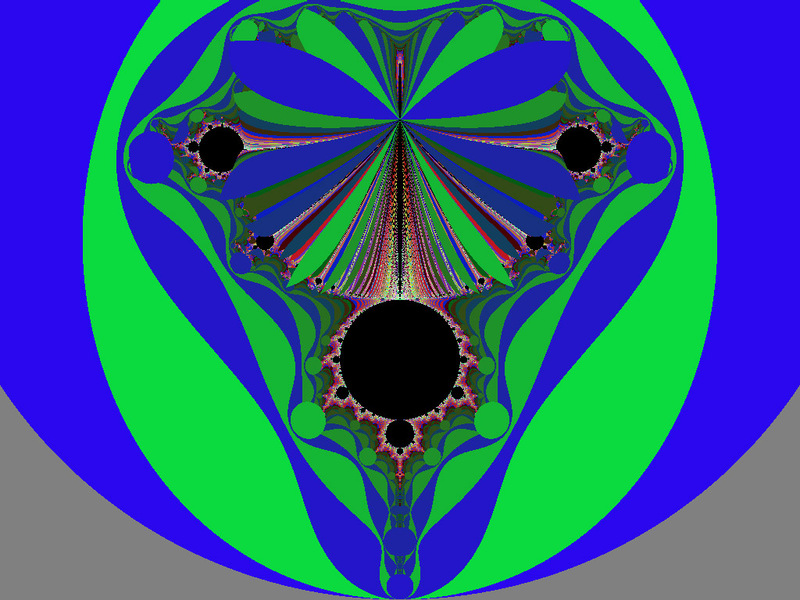 Could the Mandelbrot Set have some of the answers to our problem? The best efforts to understand the dimensionality of space and time are based upon a mathematical formulation of Physics, and upon an acknowledgment of harmonious patterns in the structure of mathematics itself. The realm of all possible geometries is the playground of mathematical theorists, who have discovered many wonderful things about different kinds of dimensional spaces. The nature of the space which we inhabit, in this universe, may be understood by studying the attributes of these different kinds of theoretical spaces, and comparing our real-world experience to those models. As it turns out, theories based on a 10-dimensional space can explain a lot about our universe, but there is also something very special about a three-dimensional reality which allows certain classes of form not found in higher, or lower, dimensional spaces. Most notably, knots in a 3-dimensional space can't untie themselves. The question arises of how form emerges, and how space can evolve from one set of dimensions to the next (from a 2-d to 3-d space, for example). To answer this question is pivotal to both Cosmology and Unifying theories (a UFT, TOE, or GUT, etc.). The use of Fractals as a bridge between the dimensions can augment our toolbox significantly, in our efforts to find the underlying geometry of the universe. The very definition of the word Fractal involves the concept of fractional dimensions, and objects which lie between 2-d and 3-d, or between 3-d and 4-d, for example. Physicist Andrei Linde, and others, have found fractals helpful in modeling the behavior of the early universe. Their work suggests that the fractal nature of space may actually be the cause of gravity. 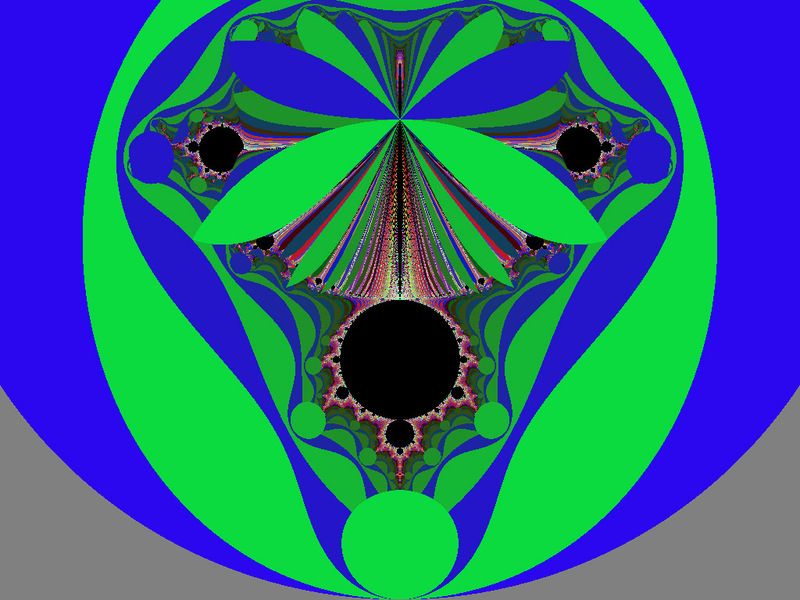 More recently; the work of Alain Connes has shown that noncommutative spaces evolve fractality naturally. 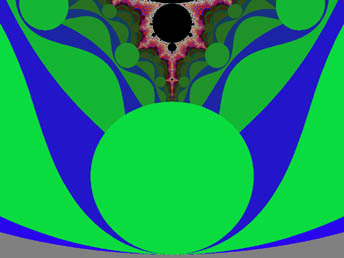 The Mandelbrot Set is the most complex fractal object which can be represented in two dimensions. In my opinion, the Mandelbrot set and its derivative forms (including the Fractal Butterfly) have a lot to convey, which aids our understanding the nature of space, and will help solve the riddle of gravity. Recent observations of the large-scale distribution of matter in space show it to have a fractal pattern. If any degree of isomorphism between the Mandelbrot Set and the Cosmos exists, the very shape of it should reveal or suggest the big picture, the true face of Space and Time. The biggest problem with direct experimental efforts to measure the dimensions of space-time itself is that anything we use to measure it originates inside of it, and to really see the shape of space or time, we would have to be outside of it. This is especially important if, as Einstein suggested, the fabric of space is curved. An object such as a measuring rod may appear straight, or flat, but it is being stretched with everything else. It will actually follow the curve of the universe, being bent in the direction that space curves, and stretched to the same degree as local space. Since an object which follows a curved path in space experiences the same forces as an object whose path is curved in time (accelerating or decelerating), scientists have come to view time and space as one entity, which is called space-time. The fact that space is curved, or stretched, is believed to be the cause of gravitation, as it is explained by relativity theory. Massive objects will actually bend the fabric of space toward them, according to this description of the universe, creating a gravity well. 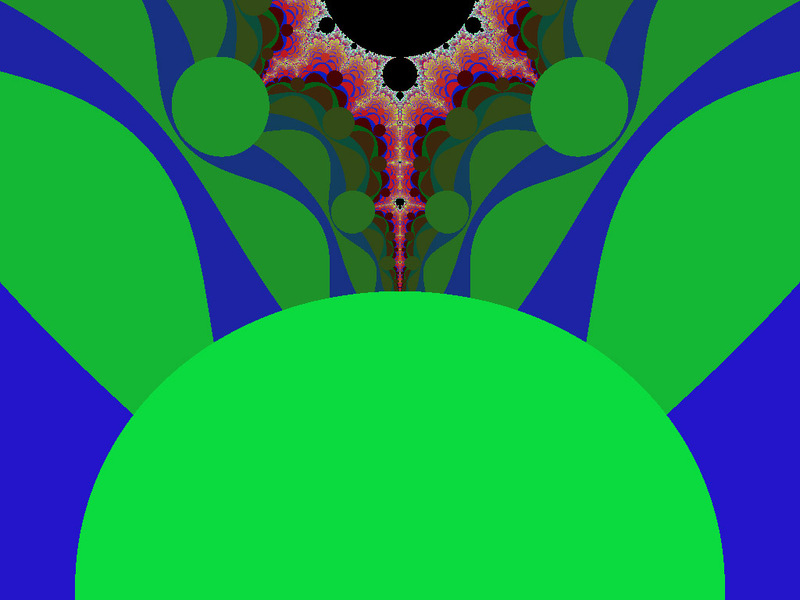 The border of a fractal is the very embodiment of the stretching of space, and the Mandelbrot Set demonstrates this quite clearly. It encloses a finite area and yet the length of the boundary is much larger than a circle of the same area. Also, it's apparent boundary grows as the size of one's measuring rod diminishes. The perimiter of the outer circle is easy to calculate, but each color band further inward is more and more convoluted, and it becomes hard to measure the perimeter exactly, very much like many natural coastlines. Although the building of form proceeds smoothly from one color band (denoting the repeller sets) to the next, in the manner of smooth waves building upon each other, the cumulative effect results in areas where the edge is folded back upon itself. It should be noted that the outer bands are forms which can be resolved in a few calculations, and they are simple shapes with relatively smooth outlines. As one proceeds inward, the shapes become more articulated, and their features require many more calculations to resolve. 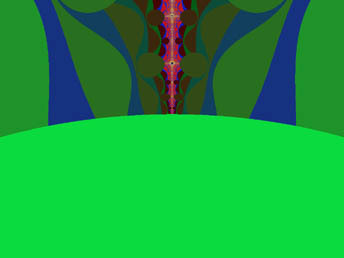 In most parts of the Set, only very tiny waves are anywhere near the edge of the figure, which lies inside all of the color bands. Near the cusp, at (0.25, 0i), the fine detail of local features requires enormous numbers of calculations to resolve, and the waves in the repeller sets (of the innermost color bands) are very tiny indeed. Near the tip, at (-2, 0i), however, all of the longer waves in the repeller sets converge, and meet up with the shorter waves. Even the color bands requiring the fewest calculations to resolve touch the Mandelbrot Set itself at the very tip. It appears as if the waves which emanate from the end nearest the cusp are being absorbed by the structures on the opposite end of the figure. 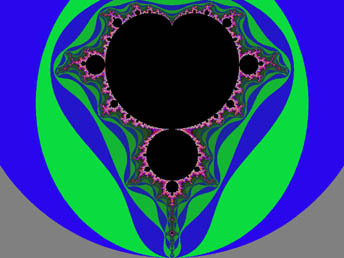 In the tail, near the tip, you can find the largest of all the miniature Mandelbrot figures. If you overlay the form of the Fractal Butterfly, you find that the largest of all the circular figures is centered about this feature. This seems especially significant to me, and I will explain why later. The Gravitational force has a powerful influence, but unlike the other fundamental forces, it does not have an intermediary which we have been able to directly observe. The magnitude of the gravitational force is smaller than the electromagnetic or nuclear forces. The graviton, if it exists, is very tiny, and rather difficult to measure. Scientists are now doubtful that the riddle of gravity will be unraveled by using the same technology that allowed us to verify that the weak-nuclear force and the electromagnetic force are unified at high energies. Particle accelerators have allowed us to probe the depths of sub-atomic structure. The level of energy required for observing the final unification of the fundamental forces directly will probably not be attainable by any particle accelerator in existence, or now planned to exist. This may not matter, however, as there are other natural phenomena which can be observed which already exhibit the characteristics necessary to give us such insight. Perhaps the nature of gravity is a problem which is not soluble by searching in the realm of the extremely small, and another approach is required, if we wish to learn more. We can go to the opposite end of the spectrum of scale, however, and study gravitational effects in the largest objects known to exist. Instead of a microscope, we can use a telescope to study the nature of the cosmos. We can learn a little bit about the large-scale structure of the universe, and we can learn about the entities of form which inhabit it. There are many different ways we can observe gravitational effects at work in space. Some of the patterns into which clusters of stars form suggest motion quite clearly, and this makes it easy to see that the cosmos is not standing still. We can study the swirling patterns of galaxies and nebulae, and learn a lot from this, as they evolve over time. Stars and gas clouds can be great fun to observe, because they are bright and showy, but there are far stranger objects in the sky. The largest singular solid objects in existence, in terms of their mass, are the collapsed cores of dead stars. Whether a star becomes a white dwarf, a neutron star, or a black hole upon expiring depends almost exclusively upon its mass prior to extinction. Larger stars are destined to become one of the latter. Stars burn by evolving higher elements through nuclear fusion. When a star has expended its primary fuel, hydrogen, it will at first begin to burn secondary sources of fuel, starting with helium. Each time it runs out of a source of fuel, it will implode, then heat up through gravitational compression, until the next heavier element will burn. As this process proceeds in a larger star, its outer atmosphere will puff up, and it will become a red giant. When a certain point is reached, no more energy can be derived from the available fuel, and the star collapses. It goes nova, flaring brightly for a relatively short while, then it winks out. Smaller stars become something called White Dwarfs when they die. These are made of densely packed atomic matter which slowly cools over time. Though the stuff it is made of is highly condensed, and has had most of its electrons squeezed out, the atomic nuclei are intact. Medium sized stars have a little more mass left, once they have gone nova, and they become something called a Neutron Star. Even atomic nuclei are crushed by the weight of surrounding matter here. In a neutron star, all of the matter is so condensed that it can only exist in the form of neutrons, which are the most stable of all the elementary particles. The substance of a neutron star is so dense that a spoonful would weigh several tons, if you could pry it loose somehow. The gravitation from a neutron star is so great that it can slowly pull a companion star apart, adding to its own mass, and releasing energy in the process. But this may not be the final stage of evolution for a double star system. If there is enough substance in the grasp of a Neutron Star, especially if its companion was larger to begin with, it may evolve into the next category of object, as well. When a star is extremely large, there is a good chance that it will become something called a Black Hole. If there is enough mass left after a large star has gone supernova, scientists believe it must become one of these. This entity is virtually gravity incarnate, since it has no physical substance whatsoever, only mass, volume, and spin (plus, perhaps a magnetic or electric charge). Even light is drawn into the heart of a Black Hole, since it cannot escape the event-horizon of its outer edge. The gravitational effect of these objects is so great that anything coming close enough to feel its tug will eventually be pulled in. This phenomenon is mirrored by the activity taking place on the far end of the Mandelbrot Set, and the Fractal Butterfly figure derived from it. We see that both the particle-like aspect (circular forms in butterfly figure) and the wave-like aspect (waves in the repeller sets) appear to be drawn into the gravity well at the figure's base. Near the extreme tip of the butterfly figure, at (-2, 0i), we find the largest of all the circular objects. 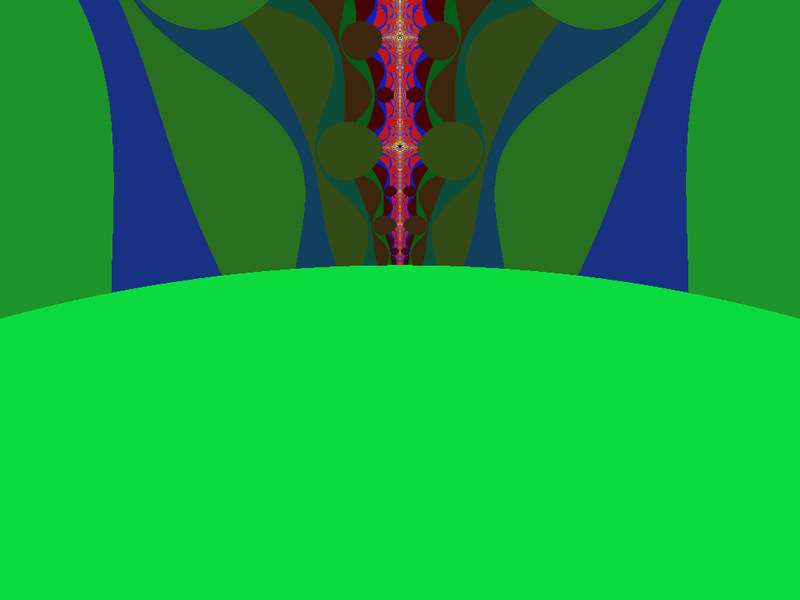 This object appears to be at the bottom of a well formed by the repeller sets, or color bands around the edges of the Set. As previously noted, the longer and shorter waves of form converge at this point, which all the waves seem to be drawn to. The large circular object obscures our view of underlying form, but the effect of proximity to this object upon nearby forms is quite pronounced. It appears to elongate or flatten those forms which would otherwise be circular, much as a black hole is believed to act upon particles of Matter. Close to the edge of this form, a disk may be flattened so that its width (or its length) is far greater than its thickness. The circular forms here become lozenge or balloon shaped. Is the large disc the Black Hole of the Mandelbrot Set? This largest circular form is recessed especially far from the edge of the repeller sets out on the spike, at the extreme. The edge of the disc is flush with the edge of the Set so that it just obscures the final extent of the spike itself, and meets the repeller sets at the far end. As with the other circular objects, it is at a favorable energy level with respect to its surroundings. In other words, it requires fewer calculations and less energy to resolve, or maintain, this form than those areas of the repeller sets which it overlies, or the Set itself. It is exceptional, however, in that it completely obscures the spike, and all of the other circular forms around the periphery leave a small region of the higher-iterated areas exposed on the side away from the edge of the M-set. So; it would seem that we are cut off from some kinds of knowledge, either by nature, or by what our calculational process has revealed. Or are we? The appearance of the largest disc seems to depict the ability of the gravitational force to swallow, or contain, vibrations which would otherwise emanate from an object, and the near-absolute containment of energies by a black hole. The event-horizon, or containing edge, of a black hole hides the information, or the energies, of what is inside escape to be seen in the outside world. What is hidden is not necessarily unknowable, however, and the Mandelbrot Set may give us a way to see it. If this theory proves valid (or informatively relates to our world) we have the ability to model these things on a home computer, and strip away the layers of form (including the various circular areas, representing particles) to see what is underneath each. We can peer into the background, seeing the patterns of formation which give rise to form, or see the objects and forms which would exist if the forms we know did not. In this area of the M-set, we can see the relative movement of forces behind the impenetrable barrier of the event-horizon of a black hole. Perhaps the secrets of gravity, which would lie behind this barier, are now in our grasp. The large-scale structure of the universe is a key determining factor of a great many things, including the eventual fate of the universe itself. The problem is that we can't see everything in the universe from where we are, even theoretically. The observable universe is but a portion of the cosmos in its totality, which is truly mind-boggling in its scope. Even though the Hubble Telescope continues to bring us breathtaking images from beyond the rim of what we've ever observed, there will always be far more of the universe outside the range of any telescope it is possible to construct. In addition, the universe continues to expand. It is expanding so much, in fact, that the farthest edge of the observable universe appears to be receding from us at the speed of light. And we now know that the universe is expanding more quickly than it once was. The question is, what will come of this expansion? To formulate a meaningful answer to this question, a number of issues must be raised. Scientists were trying to determine whether there is enough matter in the universe to eventually stop, or reverse, the expansion of our universe. Instead, we are now trying to deal with the question of why the universe's expansion appears to be speeding up. For the reasons stated above, we may never be able to see enough of the universe to accurately gauge the extent of it, much less its mass, by direct measurement. Nor can we accurately judge how our galaxy is moving through the universe from here. There is some evidence that the local neighborhood of our universe is being pulled toward a Great Attractor, but scientists differ on whether this is actually a feature of the universe, or merely a 'local' pattern of movement. 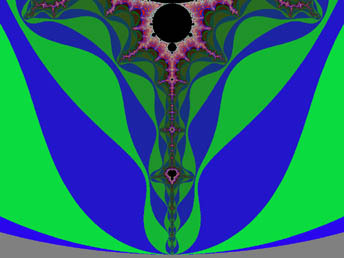 The interpretation of the Fractal Butterfly from the Mandelbrot set as a pattern for universal evolution could suggest that there is another side to the story, and the universe, where that other side has been unfolding in the opposite direction in time. Perhaps a Great Attractor somewhere in the universe will unite our neighborhood with the other side of reality. Of course, this is likely to happen several billion years from now, if it does indeed transpire. Specifically, the Mandelbrot set and its relatives would seem to indicate that a universe of anti-matter was spun off in the opposite (or a different) direction in time, and in a faraway direction in space, largely (or totally) outside of the universe that is observable from here. This could account for some of the missing matter (required to make the expansion stop or create the 'flatness' of space) which scientists are still searching for. At the end of time as we know it, the fabric of space could curve back upon itself, converging on the Great Attractor, which I have presumed to be a super-massive Black Hole. The interesting thing is that the merging streams of opposites would form a circle, or circuit, which appears to make the ending a beginning, as well. Perhaps this represents a cycle of creation, or a pattern within cycles of creation, that is itself universal. The Mandelbrot Set is bounded by a circle. Perhaps reality itself is of the same nature. for commercial purposes is not allowed. thanks for your support! - j.d.